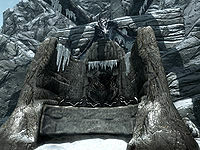 Skyborn Altar is a mountaintop dragon lair located in the mountains east-southeast of Morthal. The path to Skyborn Altar is located just south of Labyrinthian; it can also be reached from the south by traveling between Silent Moons Camp and Dustman's Cairn. From either direction the dirt path is marked by a stone head to the east, and to the south of the last (or first) stone arch. The word wall here teaches part of the Frost Breath shout. The wall is guarded by a leveled dragon which is resting on the wall. There is a dead adventurer slumped against the right-hand side of the wall, a chest is located behind the pillar to the far left, and there is a burial urn a few feet north of the chest, hidden in the rocks. Before the dragons' return, the wall is guarded by a wispmother and her wisps. 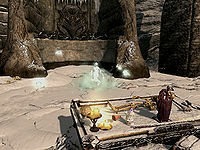 In front of the wall is a sacrificial table, and on it is a shrine of Akatosh, a dead skeleton, two leveled soul gems, a leveled potion, and a leveled weapon. A silver ore vein is located a short distance southwest from the bottom of the steps. Three orichalcum ore veins are located 140 feet southeast of the altar (map). A moonstone ore vein is located in a gap in the rocks to the northeast, between the altar and the Shrine of Mehrunes Dagon (map). There is an adept-locked chest due south of the word wall. Follow the path down two flights of stairs, past the first tree on left with a lump of rock next to it and at the second tree turn due east. The chest is behind the tree against the rock face. The dragon's death animation may plow into the rock from the north and leave a trail but no dragon. Climb down to the north to find the dragon's body. Sometimes this area might not become cleared even after killing all inhabitants. Reloading a save before clearing it and trying again will fix this. This page was last modified on 9 January 2017, at 13:31.